Jameson's Black Barrel isn't called that because it listens to goth music and therefore only wears black barrels. But after taking a sip or two or several, Thrillist did come up with a musical comparison: if Jameson's centuries-old Original is early Beatles, then Black Barrel is late Beatles -- darker, more full-bodied and complex. Whiskey lovers have also called Black Barrel "creamier", which, funnily enough, is exactly how record reviewers described "Everybody's Got Something to Hide Except Me and My Monkey"
Besides the aforementioned creaminess, this produces a nose of fruit, nectarines & apricot, and a taste that encompasses the grain's fruity sweetness, waves of vanilla, spices, and toasted wood. 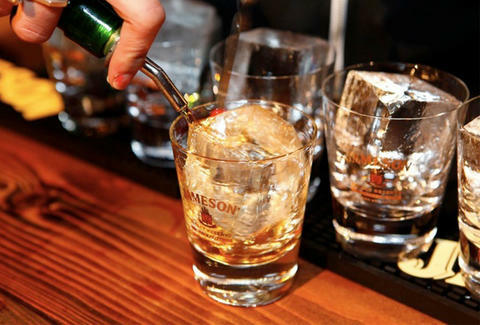 It's everything that's great about Jameson Original, "on 11", so don't be surprised if you find yourself disagreeing with Jameson and saying, "Actually, this tastes just like Spinal Tap!"